Dahntay Jones tells “First Take” crew his play against Kobe Bryant was not intentional Dahntay Jones called in to ESPN First Take Thursday morning to speak his peace about the unfortunate play which occurred Wednesday night that resulted in Kobe Bryant being injured. One of the most handsome men in the NBA is set to take a bride. 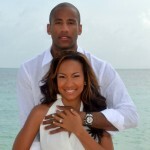 Danhtay Jones of the Indiana Pacers and his fiance, the accomplished Valeisha Butterfield officially announced their engagement while on a day trip to the islands of Antigua and Barbuda. Details of the wedding are not available, but….